Pittsburgh awoke to a big snow storm on New Year’s Day in 1973. The news that greeted Pittsburghers as they turned on their radios and televisions was unbelievable. Tragically, their star Pirate baseball player had been taken from them in the prime of his life. Roberto Clemente lost his life while trying to help others. That morning is one that Pittsburghers of the 70’s will never forget, remembering how hard it was to shovel the new-fallen snow through so many tears. You see, Roberto Clemente was easily the most popular sports figure in Pittsburgh at that time. Great man that he was though, Roberto had very humble beginnings. Roberto Clemente was the youngest of seven children and grew up in a poor household in Carolina, Puerto Rico. It was in Puerto Rico that Roberto learned to love everything about baseball. Roberto’s major league career began with the Brooklyn Dodgers in 1954. 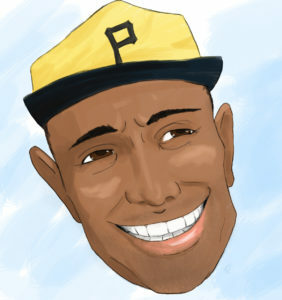 Clemente was not their star player; in fact he did not play in a single game and was soon returned to the minor leagues. Clemente, despite being kept somewhat hidden, managed to catch the eye of the Pirate’s general manager and was signed by the Pirates on November 22, 1954, for a sum of $4,000. The rule at that time was that any player who signed with a professional team for $4,000 or more had to be kept on the major league roster for that first season or be available for drafting by other clubs. Clemente went on to spend his entire career with the Pittsburgh Pirates while wearing the number 21 on his uniform. Given a chance, Roberto Clemente soon proved himself a star baseball player with a strong throwing arm and a unique batting style. But times were not always easy for Roberto. He had a heavy Spanish accent and was discriminated against by some for being a foreigner and for being black at a time when the country was racially segregated. Despite that, Clemente won 12 consecutive Gold Glove awards, earned the National League MVP in 1966, won four batting titles, was named the 1971 World Series MVP and reached his 3000th hit on his last game of the regular season in 1972. Roberto Clemente was one of the greatest baseball players to play right field and one of the best to ever play the game. Pittsburgh was fortunate to have Clemente on their roster for 18 seasons. When Nicaragua was hit with a massive earthquake in December 1972, Clemente decided to take relief supplies to the stricken nation himself after learning the Nicaraguan army was stealing supplies meant for the people. Not long after takeoff from the San Juan airport on December 31, 1972, the DC-7 plane carrying the 38-year-old Clemente and four others, along with the much-needed relief supplies, crashed into the Caribbean Sea. Sadly, there were no survivors. The five-year waiting period to be inducted into the Baseball Hall of Fame was waived for Clemente only months after his death, making him the first Latino inductee. Clemente was not only a great ball player and a humanitarian, but he was an inspiration for a whole nation. Today a bridge is named for him, “The Roberto Clemente Bridge.” It becomes a pedestrian-only bridge for Pirate home games and leads directly into PNC Park. September 18 is known as “Roberto Clemente Day” and was first announced by the Major League Baseball Commissioner, Bud Selig, in 2002. Even those who were not alive during Clemente’s time as a Pirate know his great story. Former MLB Commissioner Bowie Kuhn summed up Roberto Clemente perfectly by saying, “He gave the term ‘complete’ a new meaning. He made the word ‘superstar’ seem inadequate. He had about him the touch of royalty.” Roberto Clemente continues to inspire people to this day. Clemente never forgot where he came from and was always willing to help those less fortunate than himself. 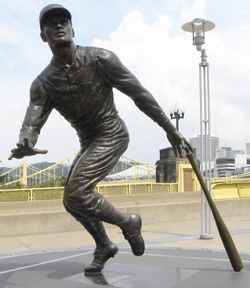 Roberto Clemente is another reason why Pittsburghers are so proud of their great city.